The Pembroke Welsh Corgi is one of the most agreeable, affectionate and charming breed of cattle dogs. Originally bred for herding sheep and cattle, they make intelligent and affectionate family pets. They are athletic dogs despite their shorter legs. Pembrokes can be red, sable, fawn or black and tan with or without white markings on the legs, chest, neck and head. The Pembroke Welsh Corgi and the Cardigan Welsh Corgi are somewhat similar but are not related. The Pembroke has no tail, tends to weigh a little less with smaller ears and less round feet. The Pembroke is more foxy in appearance, more sociable and exciteable and less territorial than the Cardigan. 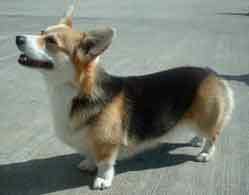 A short, small dog, Pembroke Corgis are 10-12 inches at the withers and weigh 18-27 pounds. They need to be kept active and not be overfed or they will become obese which is very bad for their elongated backs.